Connor starts all sorts of interesting/deep/funny conversations lately. I enjoy them. I enjoy talking with him rather than to him. I enjoy his curiosity and perspective about things. For instance, the kid just will not let go of the fact that one of our smoke detectors sits uncovered and battery-less. He brings it up numerous times a day...so can you fix it already Ian?! But sometimes the things he says can really throw me for a loop. Like that awkward moment when he told me I won't go to heaven. Connor: What will happen to me when I die? Me: Why don't you tell me what will happen? Connor: I will go to heaven with Jesus. Connor: What will happen to you when you die? Me: I will go to heaven and be with Jesus too. I decided not to ask where he thought I would go! I don't think Connor knows about hell and I am pretty sure he was joking, but still! I really am enjoying this phase. Hearing him talk more about his likes and dislikes. Him learning about the world and wanting to talk about it. The kid was enamored with the "bad guy" we saw in the back of a cop car the other day. He wanted to ask to see the handcuffs that were on the bad guy. I told him no on that one. But its things like that, him knowing that a bad guy has handcuffs on. His little brain is a sponge and he is learning all these new little things every day. I love it...though I could do with less of the whining he now does (yeah, the whining is a new phase...one I hope that passes quickly). But you know, everything can't be sunshine and rainbows all the time! I know this wasn't addressed in your post - but my husband is a big fan of those wooden coaster bikes. 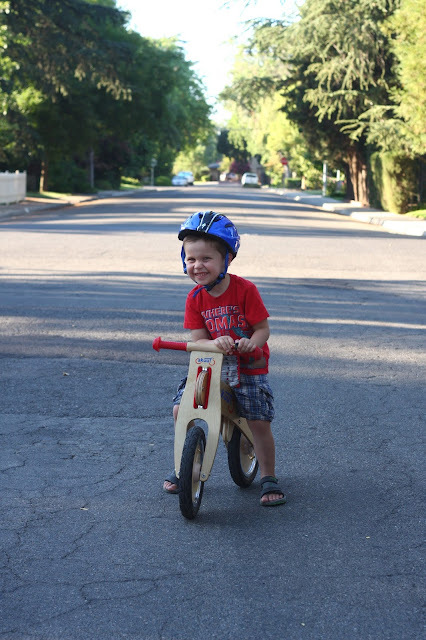 He feels they help kids ride better, sooner. And Connor looks awful cute on there too! That's what we heard. And Connor really likes it. He has even ridden it a couple miles.